SEATTLE--(BUSINESS WIRE)--Sep. 28, 2016-- (NASDAQ: AMZN)—Amazon today announced the all-new Fire TV Stick with Alexa Voice Remote, the most powerful streaming media stick available. Up to 30 percent faster than the original best-selling version, the next generation Fire TV Stick is more powerful, offers access to over 300,000 movies and TV episodes, and includes the Alexa Voice Remote – for only $39.99. The only streaming media stick with a voice remote, the new Fire TV Stick is available for pre-order starting today from www.amazon.com/fire-tv-stick and will begin shipping to U.S. customers on October 20. Eligible customers who purchase and activate their device by October 31 will also receive a free content package worth up to $65, including one month of Sling TV, two months of Hulu (Limited Commercials), and a $10 credit for Amazon Video to rent or purchase new releases or old favorites. "We are proud that our customers have made Amazon Fire TV the #1 streaming media player in the US. With more than 120,000 reviews and a 4.2 star rating, they've also made the Fire TV Stick the most reviewed product ever on Amazon," said Marc Whitten, Vice President, Amazon Fire TV. "Today, we are excited to make it even better. The new Amazon Fire TV Stick has been completely redesigned with incredible performance, powerful voice search and the included Alexa-powered remote to deliver instant access to a vast selection of movies, TV shows, games and Alexa skills at just $39.99." Great content selection – With over 7,000 channels, apps, and Alexa skills and access to more than 300,000 movies and TV episodes, it's easy to find great content on Fire TV. Choose from popular providers like Netflix, NBC, HBO, Fox, ESPN, Disney Channel, Prime Video and CBS All Access – and watch live TV and video on Sling TV, Twitter and more. Instant and accurate voice search powered by Alexa – With the most accurate voice search of any streaming media stick, Fire TV Stick with Alexa Voice Remote responds instantly and lets you easily search across more than 90 apps and channels. Just say "find suspense thrillers" or "launch Hulu" and Alexa will respond. Fire TV will also show you the best viewing options – watch, stream, rent, or buy – to help you choose apps and channels based on convenience and value. For Amazon Video content, you can also control playback with just your voice; just ask Alexa to "go back 30 seconds" or "jump ahead 2 minutes." Just ask Alexa – With Alexa and the included Alexa Voice Remote, customers can easily ask Alexa to check local movie times, create shopping lists, play music, get the news and weather, order a pizza or a ride, and much more. With thousands of Alexa skills available, and tens of thousands of developers building skills for Alexa, she's getting smarter every day. Stunning video quality – With an ultra-fast quad-core processor, 802.11ac MIMO Wi-Fi and Advanced Streaming and Prediction (ASAP) for Amazon Video, you can rely on fast, fluid performance without buffering. 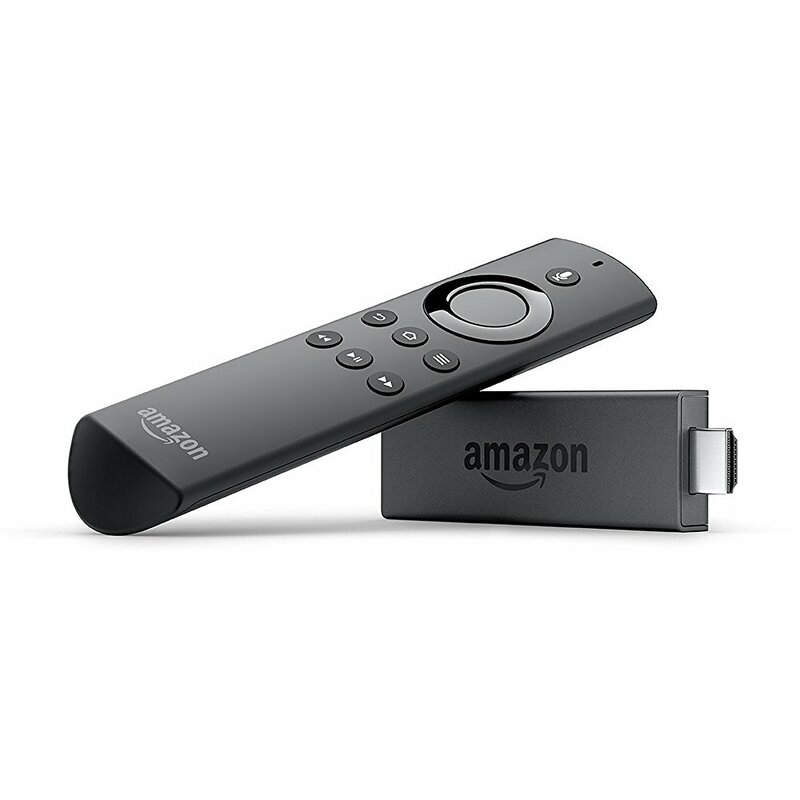 Fire TV Stick with Alexa Voice Remote also offers support for High Efficiency Video Codec (HEVC), giving customers more 1080p HD streams from their existing internet connection. Effortless setup – Plug the Fire TV Stick into an HDTV, attach the power adapter, connect to Wi-Fi, and start streaming in minutes. Find your favorite content using the included Alexa Voice Remote, or discover more to watch with personalized recommendations right from the home screen. The Fire TV Stick is also portable, making it easy to take it almost anywhere and watch all your favorite content away from home. Coming later this year, a free software update for Fire TV will give customers a new on-screen experience that makes finding what to watch next even easier and more enjoyable. Fire TV will present a cinematic experience, offering video trailers and content screenshots to help customers access the content they want more quickly – without the need to open and close multiple apps. Finding and enjoying apps and games will be easier too with new support for a customizable apps list on the home screen. Accessibility improvements will also be included, allowing customers to use Fire TV and any compatible apps with the VoiceView screen reader. These features will be available for all Fire TV customers as a free, over-the-air update, starting with the new Fire TV Stick with Alexa Voice Remote and latest generation Fire TV later this year. The all-new Fire TV Stick with Alexa Voice Remote is available for pre-order beginning today for $39.99 at www.amazon.com/fire-tv-stick and will start shipping to customers on October 20. Eligible customers who purchase online or from a participating retailer and activate their device by October 31 will also receive a free content bundle. This limited-time offer includes one month of Sling TV and two months of Hulu (Limited Commercials) for new subscribers, and a $10 credit for Amazon Video – a value of up to $65.